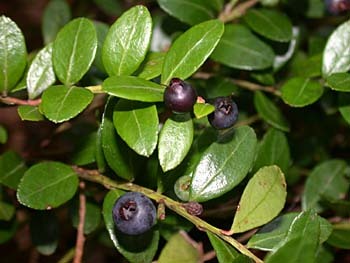 Box Huckleberry is a low, evergreen, colonial shrub that was just discovered in North Carolina for the first time in 2003 by Stefan Bloodworth of the Blomquist Garden of Native Plants (a section of Duke Gardens). This large patch covers the ground underneath a thicket of Mountain-Laurel (Kalmia latifolia) on top of a high bluff overlooking the Flat River in northern Durham County. Known from only a small number of sites in 7 states from Pennsylvania to Tennessee, this colonial shrub is self-sterile. Since colonies are far apart, it rarely sprouts from seed. The nearest known site to this one is in western Virginia. 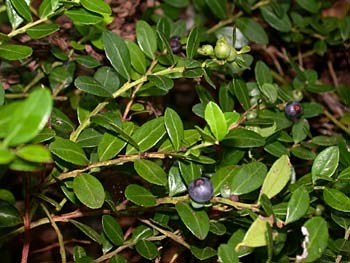 The thick, glossy, minutely toothed leaves are unlike those of other Gaylussacia species, more closely resembling Japanese Boxwood (Buxus microphylla) or Japanese Holly (Ilex crenata). The stems are distinctively angled. Since it is so different from other huckleberries, Box Huckleberry is sometimes split off into its own genus - Buxella brachycera (Michx.) Small. These photographs were taken on 7/15/2003 in Durham Co., NC. 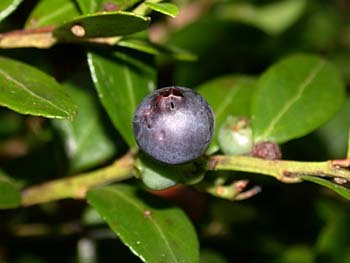 The fleshy berries are dark blue and tasteless when ripe. Wilbur RL and Bloodworth S. 2004. Notes on the box huckleberry, Gaylussacia brachycera (Ericaceae), and its unexpected presence in North Carolina. Rhodora 106: 371-377. Pooler MR, Dix RL, Griesbach RJ. 2006. Genetic diversity among accessions of the endangered box huckleberry (Gaylussacia brachycera) based on AFLP markers. Journal of the Torrey Botanical Society 133 (3): 439-448.